Electric curtain track for auto opening and closing, custom made to your specifications. Double or single treatment option available. Clutch system allows for drapes to be opened and closed manually. The drapery hangs below the track for optimum performance.Can be easily controlled with an IR receiver. System can be used with home automation systems. Plugs directly into standard 115V AC duplex receptacle. Price includes track, motor with IR receiver, 10 feet of cord, remote control and hardware. Tracks over 192 inches will have $150 crating fee added to price. Custom made to your width. Width up to( Feet) --select-- 8-ft. 16-ft. 19-ft. Priced by pair. Material: plastic. 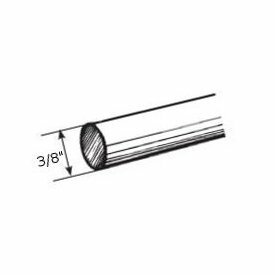 HD27106D: Decorative curtain rods smooth ring slides 66"-120"
Kirsch wood trend 3 inch diameter smooth wood pole. Wood drapery rods. Ships by truck. Big, wide and long wooden drapery poles by Kirsch. Note: Some colors are more, unfinished is less than amount below. Extra long drapery rods can be used with many types of curtains. Rods are metal, slides and finials are plastic. If you need to buy extra long curtain rods, BasicQ is the place to shop. This 240" curtain rod is for wide window treatments. Projection 3 1/2 to 4 1/2 inches. Super heavy duty. White finish. For 2 drapery rods in one window, this item is available up to 228 inches. Projects 2 3 1/4,inner, and 5 6 1/2 inch on outer, clearance 1 1/4 2 1/2 innner, 4 1/2 5 3/4 on outer traverse rod. Includes cord tension pulley. Graber super heavy duty window drapery rods features include a universal front loading end bracket, metal adjustable and reversible master carriers ball bearing end pulleys, a spring loaded side gate for adding or removing slides, molded, canted slides, can be converted to one way draw, scored center support base for easy mounting on narrow casings, universal cam lock stirrup, braided polyester cord, and angled tip on overlap arm. Drapery double rods. Super heavy duty window drapery rods. White finish. Projection, 5 to 6 1/2 inches, outer rod. Clearance 4 1/2 to 5 3/4 inches, outer rod. A commitment to quality. Graber super heavy duty features include a universal front loading end bracket, metal adjustable and reversible master carriers ball bearing end pulleys, a spring loaded side gate for adding or removing slides, molded, canted slides, can be converted to one way draw, scored center support base for easy mounting on narrow casings, universal cam lock stirrup, braided polyester cord, and angled tip on overlap arm. Extra long double drapery rods. Each. Two way draw.Superfine traverse rods. This double drapery rods set includes double drop in traverse rods for a combination drapery treatment. Sizes over 94 inches will have an oversize freight charge manually added. Notification of amount will be emailed for approval before shipping. Superfine Traverse Rods include drop in brackets, supports and cord tension pulley for installation. Made from heavy gage steel with a baked enamel finish. Exclusive Kirlon on all sliding surfaces. Push in brackets and extension plates are available as an option. Only the finest pulley sets are used. Strong and durable with a slide gate for easy removal of extra slides. Long wearing, stretch resistant polyester cord and continuous lacing for use at either end or to convert to a one way draw. Two way draw, extends from 100 to 180 inches. Double curtain rods by Kirsch. White finish.Lockseam, double, 2" clearance. Includes brackets for mounting. Uses include double curtain treatment, sheer in back, privacy fabric in front and also used with a curtain with valance. Extra long drapery rod, includes 47 slides and 5 support brackets. Clearance 2 to 3 inches, return 3.5 to 4.5 inches. One way right. Superfine traverse rods. Best Quality drapery hardware rods you can buy for the money. Sizes over 94 inches will have an oversize freight charge manually added. Notification of amount will be emailed for approval before shipping. Kirsch traverse rods 3235 will cover that wide window, up to 180 inches. Superfine Traverse Rods include drop in brackets, supports and cord tension pulley for installation. Made from heavy guage steel with a baked enamel finish. Exclusive Kirlon on all sliding surfaces. Push in brackets and extension plates are available as an option. Only the finest pulley sets are used. Strong and durable with a slide gate for easy removal of extra slides. Long wearing, stretch resistant polyester cord and continuous lacing for use at either end or to convert to a one way draw. One way draw, extends from 100 to 180 inches. Project 2 3/4 to 4 1/4 inches inside and 6 1/4 to 8 1/2 inches outside rod. White finish. A double curtain rod combination for a traverse rod layered wide pocket topper valance treatment. Clearance 2 to 3 1/2 inches inner and 6 to 8 1/4 inches outer. Pocket size 3 to 3 1/2 inches. Made of heavy .0165 gauge steel. Laced with heavy duty braided cord. Standard cord length is 7 feet on all Graber traverse rods. Drapery double rods. Graber double bracket curtain rods.